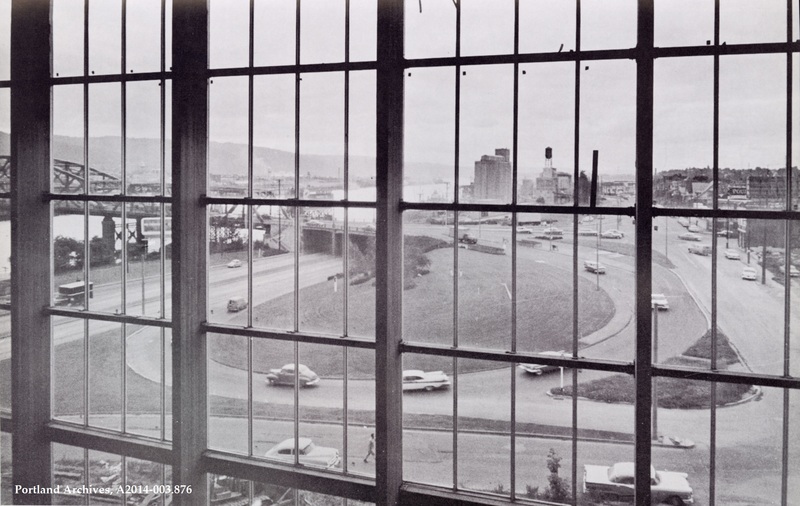 View from inside the Memorial Coliseum, looking at N Larrabee Avenue and N Interstate Avenue, 1961. City of Portland (OR) Archives, A2014-003.876. Aerial of the Kenton neighborhood, near N Denver Avenue and N Interstate Avenue, 1947. 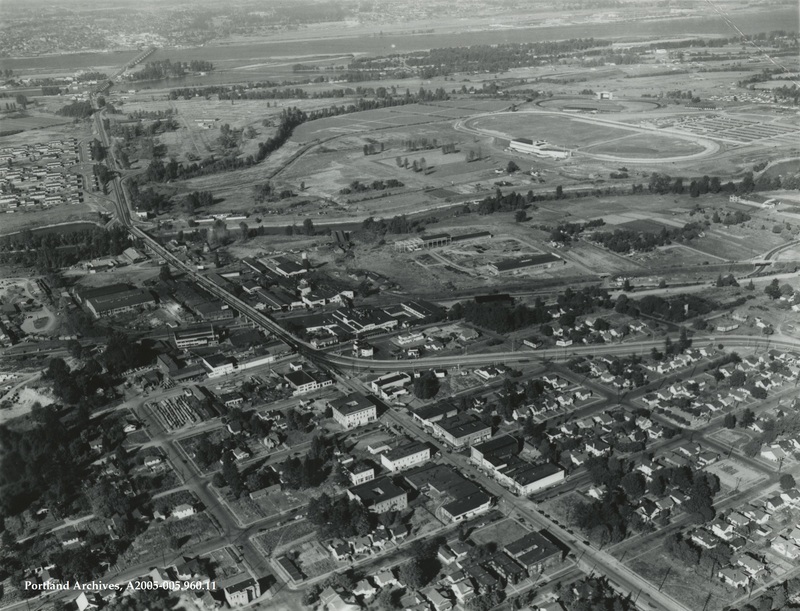 Vanport (left) and the remnants of East Vanport (right) can be seen in the In the upper left portion of the image. City of Portland (OR) Archives, A2005-005.960.11. Paul Bunyan just got a face lift! The Kenton statue’s new look was revealed this past weekend at Tall Paul Fest. Head down to the corner of N Denver Avenue and N Interstate Avenue to check out Paul’s new paint job and compare the differences with this version of the statue from 1975. 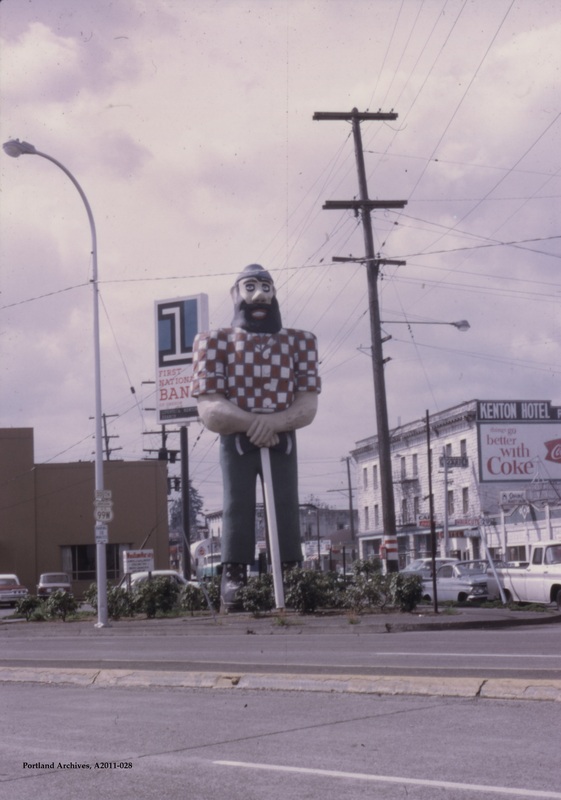 City of Portland (OR) Archives, Paul Bunyan statue, A2011-028, 1975. 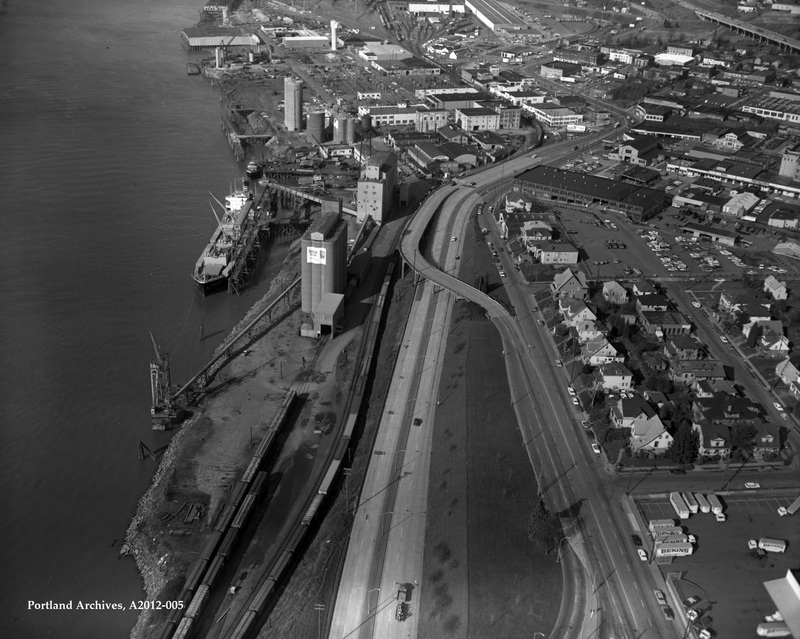 Aerial of the area north of the Broadway Bridge, 1970. 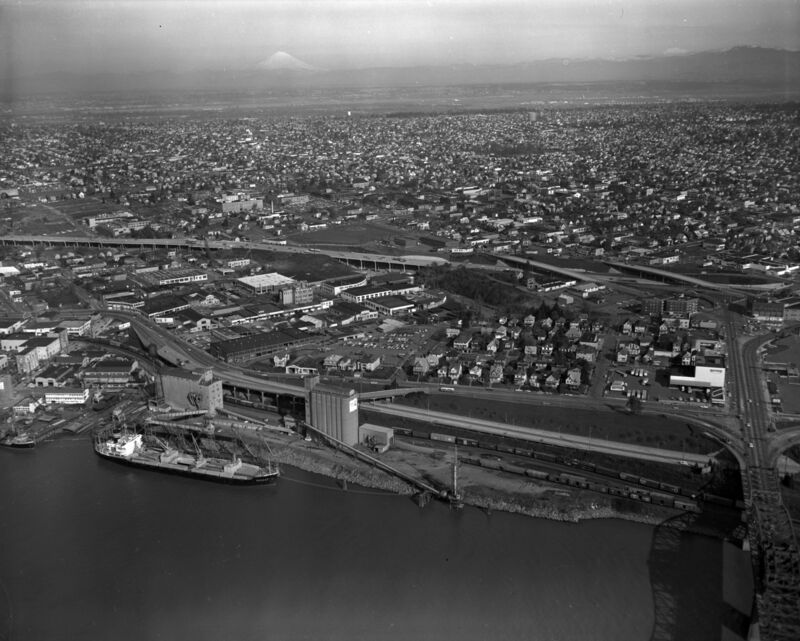 City of Portland (OR) Archives, Aerial of the area north of the Broadway Bridge, A2012-005, 1970. Aerial of N Interstate Avenue near Overlook Park and Interstate 5, 1970. The Kaiser Permanente Interstate medical campus now sits on the site across from the park. 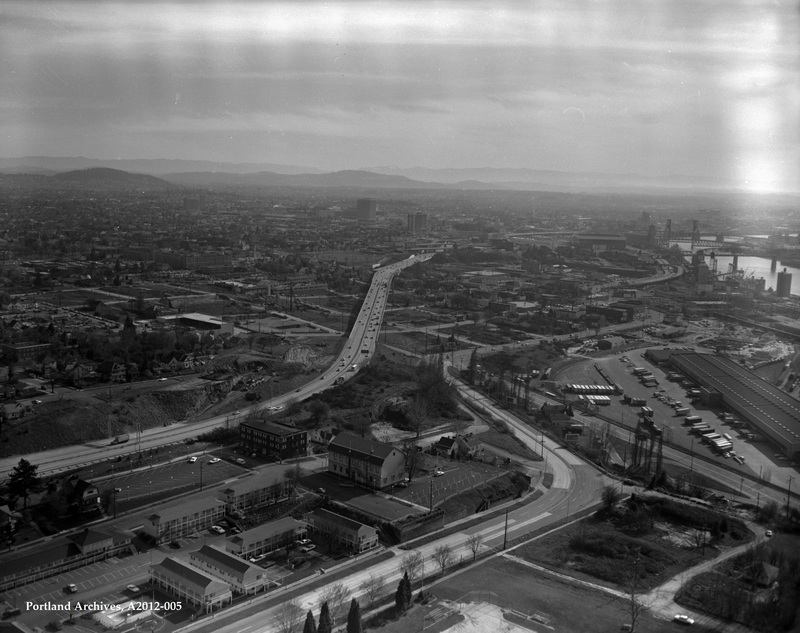 City of Portland (OR) Archives, N Interstate Avenue near Overlook Park and Interstate 5, A2012-005, 1970. 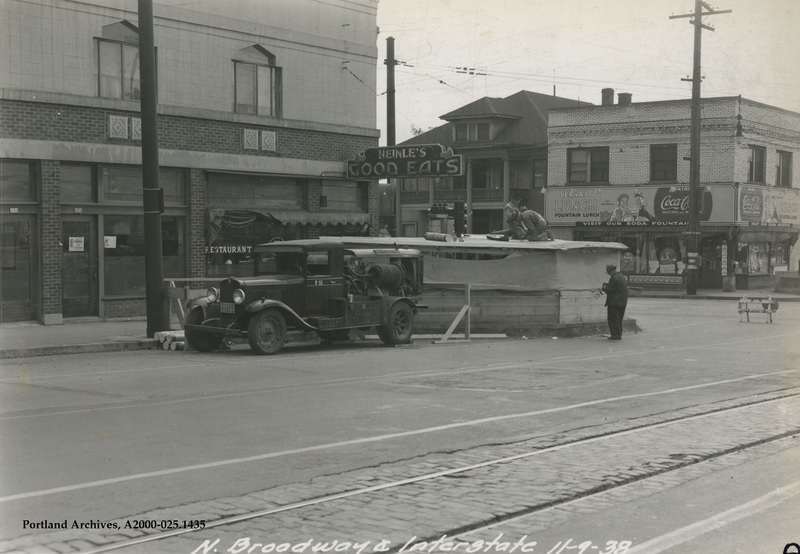 Reconstruction of the pedestrian subway at N Broadway and N Interstate Avenue, 1938. City of Portland (OR) Archives, A2000-025.1435. N Larrabee Avenue crossing over N Interstate Avenue, 1970. This aerial comes from a Model Cities Urban Renewal Program grouping. The program was conducted in inner North and Northeast neighborhoods with the goal of improving livability by creating or expanding green spaces and the rehabilitation of housing. If you look closely at the upper portion of the image, you can see evidence of early stage construction of a structure that now dominates this portion of the Albina area. City of Portland (OR) Archives, Model Cities planning north and northeast aerials A2012-005, 1970.